High quality whey protein with great full taste without aspartame. 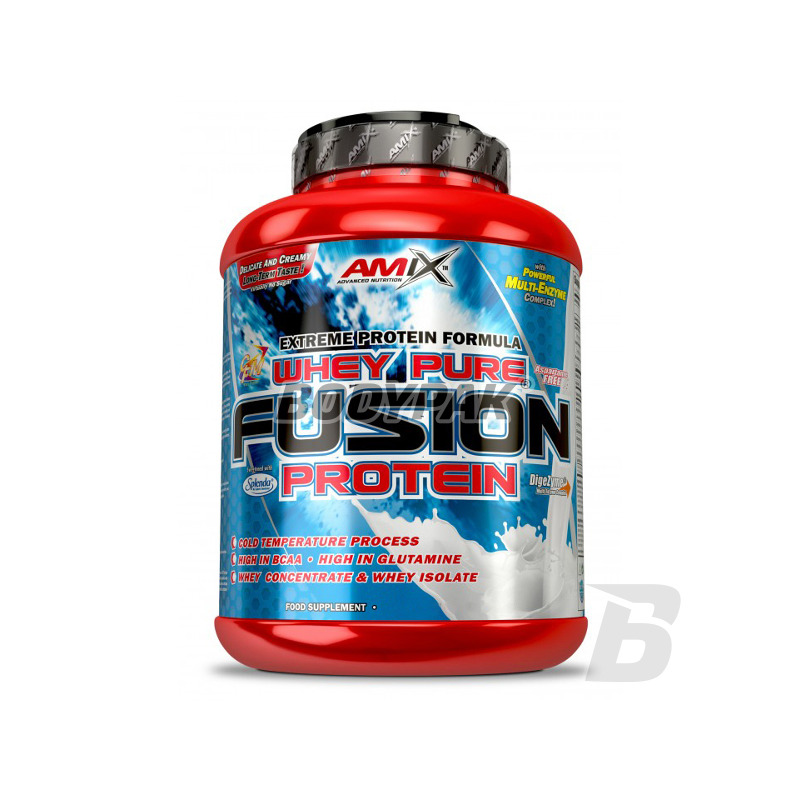 It consists of 75% pure protein, composed of Low Temperature Processed Instantized Whey Concentrate (WPC) and CFM® Whey Isolate that ensures a high biological value. 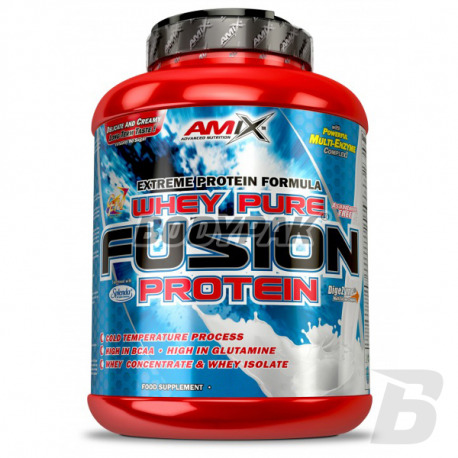 Mix 1 scoop ( 1 heaping scoop = 35 g) of AmixTM Whey Pure FUSION Protein with 200-300 ml of water or low fat milk. Use a blender or hand held shaker, mix for 30 seconds. Have 1-3 servings daily, depending on daily need of proteins. Ingredients: CFM whey protein isotope (contains beta-lactoglobuline fractions, alpha-lactoglobulin, bovine albumin, immunoglobulins, glycomacropeptides, lactoferrin, lactoperoxidase), cocoa powder ( Maltodextrins, stabilizers: collagen hydrolyzate, xanthan gum and guar gum, emulsifier: soy lecithin , sweeteners: sucralose Splenda and acesulfame K, colorant (depends on taste: banana - turmeric, strawberry And Digestive Enzyme Complex (amylase, lipase, lactase, cellulase, bacterial protease), patented DigeZyme® Multi-Enzyme Complex (amylase, lipase, lactase, cellulase). Advanced bid high protein based only on animal protein source (WPC). Promotes anabolic processes by maintaining a positive nitrogen balance! Tastes great and easily dissolves. Superb creamy texture.